When the raw tamarind is in season try out this pachadi. Select the small ones without seeds. You can just cut them into tiny pieces or crush lightly using a pestle and mortar, add sufficient salt and store it for later use after drying this in the sun. 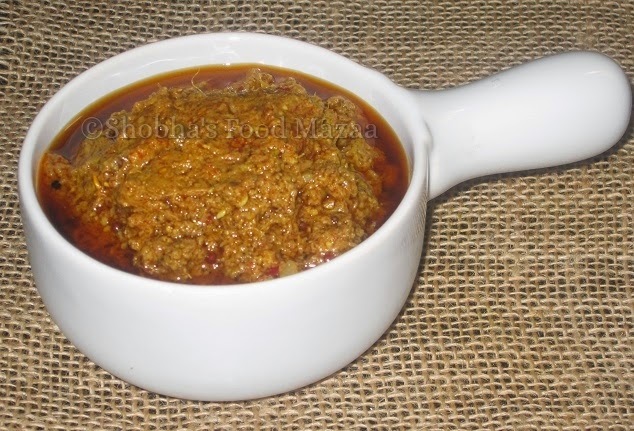 This thokku can also be used in some dals / curries etc etc The consistency of the pickle can be coarse or very fine as you like it. If you want it well blended then grind it along with the masala powder before sauteeing in the oil. The chilli level also can be adjusted according to your taste. 1. Wash the tamarind well and dry them with kitchen towel. 2. Crush them coarsely in a pestle and mortar or in a food processor. 3. You can add salt while crushing so that it blends well. 4. Dry roast and grind the mustard seeds , methi seeds and the red chillies. 5. In a pan heat oil and add asafoetida. Now tip in the ground masala powder and the crushed tamarind. Saute for a minute or two until done. 6. Let it cool. Store it in a sterilized jar. This is new to me. Looks good ! I have never had tamarind pickle ,it sounds really delcious. very interesting one,have never tried these..looks mouthwatering! !